As for The Walking Dead,I would really love to stay and chat about it but then I'll ruin it for you ;) Go watch it! You wear that outfit two years in a row!!! I'm all for it! If it's cute, it's cute. I LOVE this sweater, it's so cute! I'm really short so it could probably be a bath robe on me :) But I love it on you. I just spent 10 minutes trying to figure out how to pull off the "bun on top of my head" look, gave up, and clicked over to your blog... where I see you completely ROCKING it! Now I'm inspired to try some more :) ps: super impressed with 20+ miles! oooh i'm excited about this news!! if you find that you just absolutely cannot hold it in anymore....you can totally tell me. i know i know....that's a heavy burden for me to bear but, i'm willing to bear it. 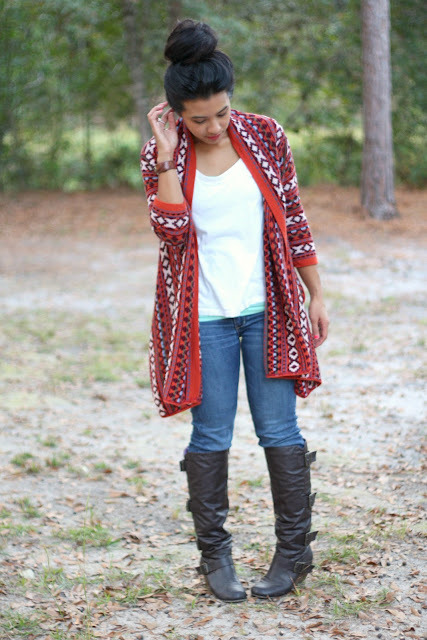 Love your bohemian-ish outfit, those boots, and your free spirit. So excited to hear your news too!!! Hugs from IL! i love that wrap its so cute. All of my friends keep telling me to start watching The Walking Dead, too! I need to have a marathon of the episodes. illy! just love the cardigan you are wearing. inspiration on how to wear my brown and red one! thanks! ah secrets are the best. can't wait for you to share it with us, confetti worthy? it's gonna be a good one! and i'm not a huge walking dead fan. i want to love it, i really do, and we watch it all the time... but sometimes, it's just reallllly boring. like they draw the story out soooo much. it's still decent though i guess. I love the wrap, its cute. And I admit it, am a new reader, come say hi! Your SO beautiful. LOVE that outfit. I hope you have a great weekend full of fun. Blessings! ohhh, can't wait to hear this exciting news! have a great weekend illy! Love that sweater! The pattern is gorgeous [and so is your awesome hairstyle!!]. I want to know your news!! AND I want to steal your wrap! I love your wrap! I'm a new reader. 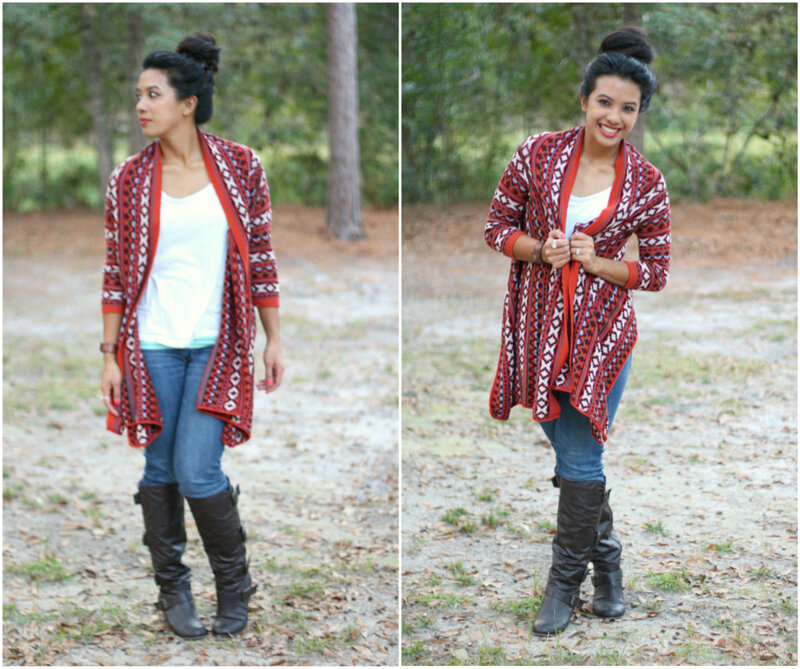 love love your cardigan! wish i got it when you got it! !